Enrich the aesthetics of your aquarium with the Orion SL-Series. The NEW Orion SL-Series LED light fixture offer a streamlined, sophisticated style for your saltwater reef aquarium. Contained in a Fan Cooled Die-Cast Aluminum casing that is only 1” in height and 6” wide. The SL-Series is the choice of affordable Controllable LED lighting that ranges in length from 16” to 48”. Orion SL-Series gives maximum illumination by employing an arrangement of the newest high performing and high intensity Blues, Royal Blues, Cool White CREE XT-L LEDs, and UV-Semi LEDs that are dispersed through 2 channels and powered by a Mean Well Driver. 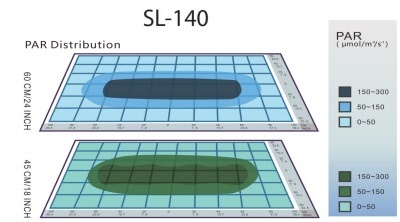 The 120 degree optics allow the SL-Series to radiate the LEDs with no dark spots or shade. The LEDs perform with the PAR (Photosynthetic Active Radiation) levels that will sustain your light loving corals. With its easy to use integrated 24hr timer, 3 different modes of operation and 6 distinct settings that you can control via remote you can change the look of your marine aquarium. The 6 different custom modes will let you program 1 out of 6 custom settings to light acclimate your corals. Control the SL-Series with the included remote control. The Orion SL-Series operates with the PAR (Photosynthetic Active Radiation) levels that will support your light needy aquarium corals. Installation is quick and easy with the multiple mounting options. Choose between the 5ft suspension kit or the aluminum alloy sliding legs. Dimensions: 32.5" x 6.5" x 8.5"
Orion SlimLine 65 Watt LED Light Fixture SL-65 - Ships Free! Orion SlimLine 100 Watt LED Light Fixture SL-100 - Ships Free!